Flowerama has been making same day delivery and express delivery to Grove City, Ohio since 1990. 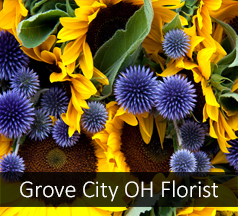 "Fancy Free Grove CIty" is named after the town of Grove City and is a popular arrangement throughout central Ohio. With four locations, award winning customer service, great prices and a top notch website, Flowerama has become the florist for the residents of Grove City. We have worked very hard to earn our reputation in Grove City and aspire to maintain that reputation every day. We also provide daily flower delivery to Grove City businesses, Grove City funeral homes, Grove City schools, and Grove City nursing homes.